Home > Your Questions > How Do You Shrink Wrap a Scaffolding? If you are looking for a quick overview of how to fit shrink wrap to a scaffolding you can download a short guide or you can watch a 2 minute video overview of the scaffold shrink wrap process here. If you have any questions or would like to arrange a scaffold shrink wrap training session, get in touch with us, we will be happy to help. Why do you want to shrink wrap your scaffolding? 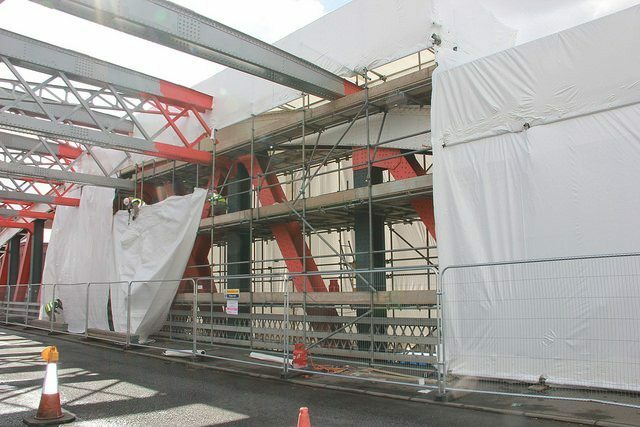 A high level of ‘environmental containment’ – Traditional style scaffold sheeting such as often referred to as ‘Monarflex’ are typically applied in 2-3m strips around the scaffolding. Where a strip of scaffold sheeting on each scaffold lift meets the sheeting on the scaffold lifts above or below, they are simply overlapped. Whilst this does provide some ‘containment’ of dust and debris, it is typically not sufficient containment for shot blasting operations where the dust may contain toxic elements found within paint residues. Using a shrink wrap sheeting for scaffolding allows welded joints between sheets which allows for the total encapsulation and environmental containment of a scaffolding structure. Smart & professional appearance – For some public and high profile projects, scaffolders and contractors choose shrink wrap sheeting because they are looking to create smart and professional appearance with the scaffold sheeting. If you are considering using shrink wrap sheeting simply to improve the appearance of a project then the set up and layout of the scaffold structure (such as installing sheeting rails to keep the sheeting clear of fittings) is going to be important. Are the weather conditions suitable? Once installed, shrink wrap sheeting is generally considered to be the most robust temporary scaffold cladding available. However, to the get best results avoid installing shrink wrap in windy conditions over 20mph or in very wet weather conditions. When installing scaffold shrink wrap, never hang more sheets than you can finish welding and shrinking that day. For temporary roofs we always recommend that you don’t start installing the sheeting unless you can finish the entire roof that day. Which materials should you use? For most scaffold shrink wrap projects, a 300 micron thick white shrink wrap film is used which has been tested as flame retardant according to the European EN13501 standard or ‘norm’. The shrink wrap is supplied on 1.8m long roll which open out to a 7 metre wide by 15 metre long sheet when fully unfolded. However, on many construction sites in the United Kingdom, you may see temporary protection products marked as being flame retardant to LPS1207 and LPS1215. This demonstrates that the product carrying the mark has been subjected to a much more extensive flame retardant certification process. 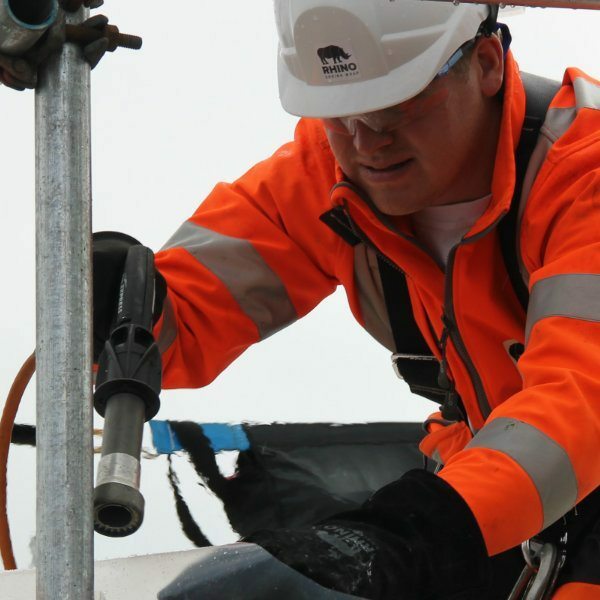 The LPS1207 and LPS1215 certification process in our experience is unimportant to the vast majority of scaffolders and contractors and because it adds some extra cost it is not chosen for the majority of jobs. However, as the use of an LPS flame retardant standard may be demanded by the insurance companies as a condition of their insurance cover for a project, it is always worth checking with your customer what their requirements are and getting the right specification sheeting from your supplier. Although shrink wrap sheeting for scaffolding is supplied in white as standard, clear scaffold sheet is readily available if required. You can access more information about scaffold shrink wrapping materials and equipment, including what might be included in a typical ‘start up kit’ here. Our most important piece of equipment is the hot air gun which is used for creating heat sealed joints or welds between sheets of shrink wrap and of course for shrinking the film ‘drum tight’. The shrink wrapping heat gun connects to a cylinder of propane gas via a hose. The hose can be almost any length but around 8 to 10 metres is ideal. Any shorter and you need to move the gas bottle frequently whilst using longer hose lengths can lead to hose becoming tangled around scaffold tubes etc. The shrink wrapping heat gun is a hand held tool, operated by squeezing a trigger which allows the propane gas to flow into the gun where it mixes with air. As the trigger is completely depressed, a spark is generated which ignites the gas and air mixture and creates a flame. Although the flame can seem quite intimidating, (with a roaring noise slightly reminiscent of a hot air balloon! ), the shrink wrapping gun is easy to use. You should always choose a heat gun where the operator must keep the trigger depressed to keep the hot air gun operating. This means that should the operator drop the gun, the trigger will be released and the gun will stop operating immediately. Every installer has their favourite type of gas gun for shrink wrapping. 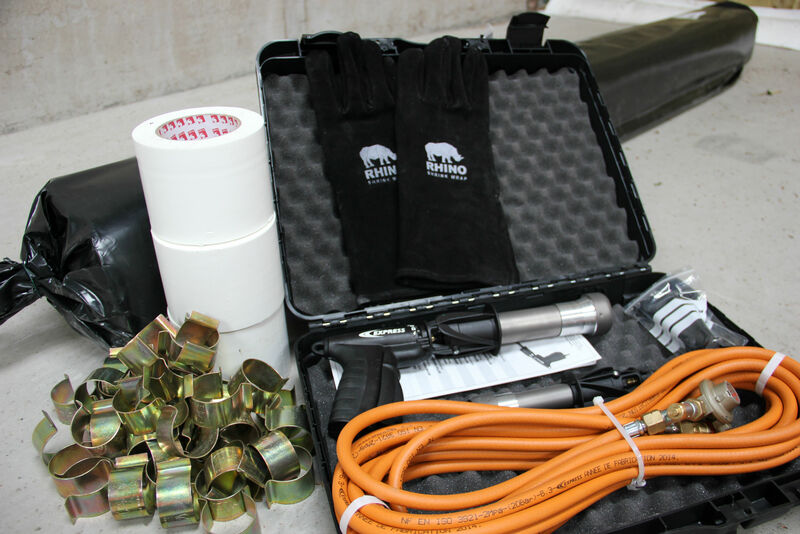 At Rhino we have many years we used heat guns manufactured by Ripack and Shrinkit and these are both excellent tools. In recent months, the Raptor 90, manufactured by another French company called Express, has been released. The Raptor is more powerful than the Ripack but also lighter to hold and less costly to buy and has quickly become a favourite amongst many on on our own installation teams. Whichever heat gun you use, we recommend storing and transporting the shrink wrapping gun in a plastic case to keep it clean and protect it from damage. Before each use we always give the gun a quick inspection – in particular we check the hose for any signs of wear or damage. For a detailed review of shrink wrapping equipment click here. Start by hanging the sheeting around the side of the scaffolding, even if shrink wrapping a temporary roof. Although it is possible for the scaffolder to install sheeting rails specifically for the scaffold shrink wrap sheeting, they generally prefer us to wrap sheets around the handrail as this saves the scaffolder time. The maximum unsecured drop for shrink wrap sheeting is around 3 lifts. Because you need to allow a little extra for overlaps (to create the weld) we find that about 7.5 metres is an ideal length of sheet. To make life easier for ourselves we find it is best to unroll the entire roll sheeting at ground level and then fold it back on to itself. When a 15 metre long roll is cut in half in this way we end up with 2 x 7m wide x 7.5m wide sheets. These are a much more manageable shape and size to take up the scaffolding and unfold to the lifts below. In particularly exposed situations we may do a smaller ‘drop’ at the highest section of the scaffolding, perhaps just two lifts. Doing a smaller drop allows us to shrink the sheeting just that bit tighter which makes it much stronger and resistant to flapping and detaching. The shrink wrap is overlapped around a scaffolding tube by 30-40cm and a clip is used to temporarily hold the shrink wrap in place. With traditional style scaffold sheeting, the sheeting is attached to the scaffolding structure using elasticated ties, ‘bungees’. These are what generally fail and cause the scaffold sheeting to blow off. The reason why shrink wrap is so popular on industrial scaffolding projects, where the detached sheeting could have massive safety issues (and the scaffolding has been designed to take any additional wind loads resulting from sheeting) is that instead of bungees, shrink wrap is attached to the scaffolding structure by allowing a 30-40cm overlap of shrink wrap sheeting around a scaffold tube which is then sealed back on to itself. In this way the scaffold tube is pocketed within the shrink wrap (although the shrink wrap does not actually stick to the scaffold tube.) This method of joining shrink wrap sheeting to the scaffold structure is much stronger than an elasticated bungee tie because the welded joint is as strong or even stronger than the original material. Generally this type of joint will be along a horizontal scaffold tube. Where another ‘drop’ of shrink wrap sheeting needs to be installed below then a joint will be required. When we train scaffolders and contractors how to shrink wrap scaffolding, creating welded joints or seals between two sheets of shrink wrap sheeting for scaffolding is something that we always practice a lot. 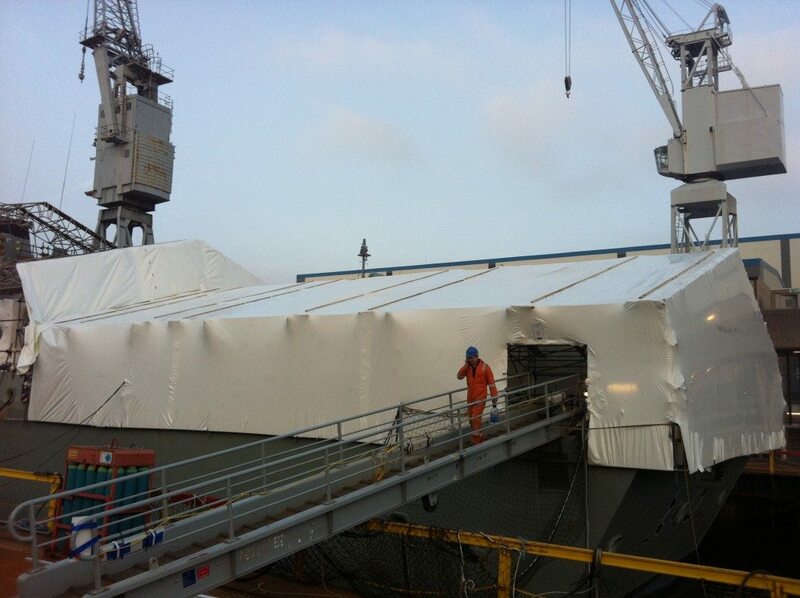 This is because it is so important to the strength of the finished shrink wrap sheeting. There are two basic types of join to master when you are learning how to shrink wrap a scaffolding. The first is the type of joint that is used to secure the shrink wrap sheeting to the scaffolding structure. The second is the type of joint that is used to join sheets of shrinkwrap sheeting to each other. ‘Welding’ describes the process of joining two sheets of scaffold shrink wrap sheeting together using heat and pressure. It involves directing the hot air from the shrink wrapping gun, between the two sheets until they are heated to a temperature close to their melt point. At this point the installer presses the two sheets together for a few seconds to allow a bond to be created. This type of joint required is where sheets of shrink wrap overlap each other horizontally. The typical way of doing this is to use a double run of tubes. These could be installed specifically by the scaffolder or a handrail can also be used for this purpose. Starting from the top of the scaffold the first sheet is dropped (typically 3 lifts / 6 metres) and wrapped / heat welded around the lowest tube, or bottom hand rail. The edge of the second sheet to be dropped is pulled behind the lowest tube where the first sheet has been attached. The second sheet is then wrapped around the highest tube, or top hand rail and heat welded. By creating a horizontal join in this way, the sheets are attached separately to the scaffolding but also bonded to each other, so creating a continuously bonded skin around the scaffolding. Vertical heat welded joints between shrink wrap sheeting are usually required where the shrink wrap is running around a scaffolding structure. Although they are very simple to carry out, a little bit of care can result in a much smarter job. The most common way our installation team hang the sheet, uses the 7 metre width of the sheet around the scaffolding, so a vertical join will be required every 7 metres. This type of joint is very straightforward. The two sheets are overlapped by 30cm and heat welded together. The first thing to ensure is that the two sheets that you are joining have been hung completely vertically as these joints will be visible from the outside. To hang a sheet vertically, use the fold lines in the shrink wrap sheet to aline it with a ledger or standard. Another important thing to remember when carrying out this type of welded joint is to ensure that the two sheets are welded together over the entire area of the overlap. As with all types of heat welded joints, the sheet should be heated over the entire area of the overlap and you should try and make the weld consistent with as few air bubbles or wrinkles as possible. When ‘patting’ the sheets together (whilst wearing a leather welding gauntlet / glove to protect your hand) you need to use sufficient force to push the two heated sections of shrink wrap together. 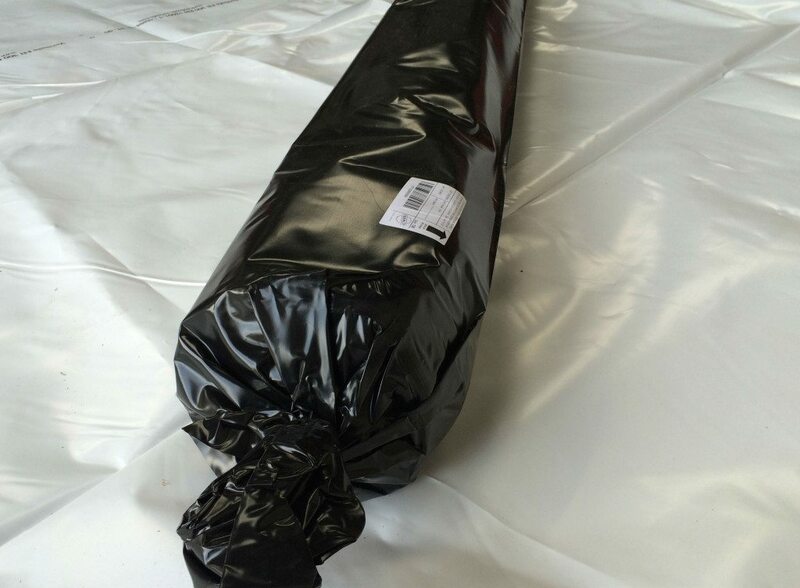 However, do not use too much force as the heated shrink wrap film may be soft and it can be possible to make a hole in the sheeting. When we teach scaffolders and contractors how to shrink wrap a scaffolding, a common mistake is not to weld right up to the edge of the sheet. Leaving a part of the overlap not welded can affect the appearance of the finished job and in extreme cases may affect the strength of the joint. Sometimes when installing scaffolding shrink wrap in breezy conditions, the wind can try and get between the joint before it has been heat welded. In this case we normally use a small piece of shrink wrap tape between the join to hold the very edge of the weld together which allows the edge to be welded. As with all shrink wrap joints, if you are using a good quality scaffold shrink wrap film it should not be necessary to tape along the edge of the weld but if you are looking for a ‘belt and braces’ approach this is something you might consider. The heat shrink process is responsible for creating the ‘signature’ drum tight finish associated with shrink wrap sheeting for scaffolding. Although it is a fairly straightforward process we certainly have some ‘tips and tricks’ to help you get the best results. This guide assumes that you are using a propane gas shrink wrapping gun but the same principles apply (although the process will be much slower) if you use an electric shrink wrapping gun. ‘Shrinking describes the process of using a hand held heat tool to blow hot air over the surface of the shrink wrap film. As the film is heated it begins to shrink. As you move the hot air gun over the shrink wrap sheeting you will notice that the appearance of the film begins to change as it becomes glossy and smooth and much more soft and flexible. This is an indication that the film has reached a sufficient temperature to begin the heat shrink process. At this point the operator starts to slowly move the hot air gun so that the entire area of the sheet is shrunk. If the operator moves the hot air gun too quickly over the film, it will not be sufficiently heated to shrink properly and there may be creases and folds left in the film and it will not be very tight. If the operator holds the hot air gun in any one position for too long, the film will shrink and then start to become thin. Eventually, if the heat is not removed a hole will be created. Although a hole can be easily repaired using the shrink wrap repair tape or patch tape, too many holes can affect the appearance of the finished job. For best results you should try and heat shrink the entire sheeted area of an encapsulated scaffolding. This will create the tightest finish and will also produce the smart and professional appearance that shrink wrap scaffold sheeting is known for. It is important to shrink in a consistent manner; i.e. start in one area and shrink the entire sheet before moving on. You should not have to go back over an area with the heat gun once it has been shrunk. For best results you should avoid heat shrinking scaffold wrap film in wind speeds over 20mph. As the plastic is heated up to reach it’s shrink temperature, for a few seconds it becomes soft and flexible. At this point the heat is removed, the plastic cools and shrinks hard. The problem with shrinking in windy conditions is that instead of shrinking, the force of the wind blowing on to the sheet while it is hot and soft, blows it into a bubble. For best results when heat shrinking, you should use less heat in the areas around a welded joint. This is because the area of shrink wrap immediately adjacent to a joint will have been heated when the weld was created and it is much easier to create a hole when heating it for a second time during the shrinking process. Hoorah, the job is finished, lets just head off shall we? Not so fast! At the end of the job you need to inspect. What are you looking for? Are all the overlaps and joints completed heat welded? Is the sheet properly heat shrunk? You can tell this by hitting the sheet – it should sound tight and taught, like a drum, when you hit it. There shouldn’t be any creases or wrinkles and there certainly shouldn’t be any evidence of creases left in the wrap when it was folded on to the roll. Even the most experienced shrink wrap installer will make the occasional hole in the sheeting during the welding or shrinking process. To repair small holes after heat shrinking you should use a white ‘patch tape’ so that the repair is almost invisible. Although this should be avoided, the shrink wrap repair tape is also used to tape around any locations where a scaffold tube is protruding through the shrink wrap sheeting. A typical roll of shrink wrap repair tape or patch tape is 100mm wide and it is generally supplied on a 33m long roll. It is important to use a tape with a high tack adhesive that will stick to the shrink wrap at low temperatures. One of the benefits of shrink wrap sheeting for scaffolding is that it is possible to make a completely sealed repair, even to large areas. Once complete, a shrink wrap repair should be as strong and tight as the original scaffold cladding. Because the tight and moulded ‘drum tight’ fit of shrink wrap makes it far less likely to flap and detach accidentally from the scaffolding in strong winds, a repair to shrink wrap is more typical after the sheeting has been deliberately cut open – perhaps to allow construction materials to be craned in. To repair a large ‘hole’, first cut a new piece of shrink wrap film which is big enough to allow an overlap around the damaged area by 40-50cm. You will probably find it easiest to use some small pieces of tape to temporarily hold the patch in the required position. Next use the shrink wrapping heat gun to weld the shrinkwrap ‘patch’ to the existing sheeting. (See ‘welding’ above). The overlapped area between the patch and the existing sheeting should be completely welded; You may fit it easiest to first direct the heat from the shrink wrapping gun between the two pieces of film that are to be joined. Once you have heated the shrink wrap film nearly to it’s melt point, press the two pieces of film together and then immediately direct more hot air from the shrink wrapping gun over the welded area from the outside. As with all shrink wrap welds, the finished joint / weld between the sheets should be smooth and wrinkle free without any air bubbles or flapping edges. Once the shrink wrap patch has been welded into position, the patch itself can be heat shrunk ‘drum tight’ as normal. (See ‘shrinking’ above). Making a repair is one of the few occasions when we recommend using the shrink wrap repair tape or patch tape to tape over the edge of the welded area. For best results, the area that the patch is being applied to should be clean and dry. A zipped access door is not essential for every shrink wrap project but is commonly used where a scaffolding is to be sheeted to provide full ‘environmental containment’ – such as during shot blasting and painting operations. There are two types of doors used in scaffold shrink wrapping operations, which one you choose depends on whether you need a door to allow access for personnel or whether you require larger access for machinery and equipment. This type of door consists of a ‘U’ shaped zipper which is sewn into a rectangle of polythene. This type of door is normally supplied as a 0.9m wide x 1.8m door or a smaller 0.9m wide x 1m high hatch type door. To install, the zipped door is first taped on to the shrink wrap sheeting in the required position (do not use a heat gun for this). The door is completely unzipped and folded back and a knife is used to cut a hole in the shrink wrap which is now revealed underneath the door. Although this type of door is excellent for projects where a high degree of environmental containment is required, this door does require that personnel entering and leaving the shrink wrapped area step over a ‘lip’ at the bottom of the door (a little like stepping through a door in a ships bulkhead). If this is unacceptable then you might want to use a shrink wrap door that can be completely rolled up from the bottom to allow completely step free access. This type of door is also much more suitable for use where pieces of equipment and machinery need to be moved in and out of the shrink wrapped area. This type of door is supplied as a pair of straight self adhesive zips. The zips are applied to the shrink wrap sheeting at the required distance. They are unzipped from the bottom and to create the opening in the sheeting, a knife is used to cut through the middle of the zip and the shrink wrap sheet underneath. Whilst this type of door allows much larger access to be created, it cannot create quite the same level of sealed containment that is possible with the smaller walk through ‘hatches’.